There’s much technically about the photo that could be better, especially the focus, and maybe a tad of a bigger number (smaller hole) aperture to the depth of field not quite the shadow. But the joy was capturing this while perched on a chair, holding the camera up over the gutter, and blind aiming down the gutters. The first thing is that rain in a dry climate is always special, the water precious. It says… “there must be something unique going on you can find with a camera”. 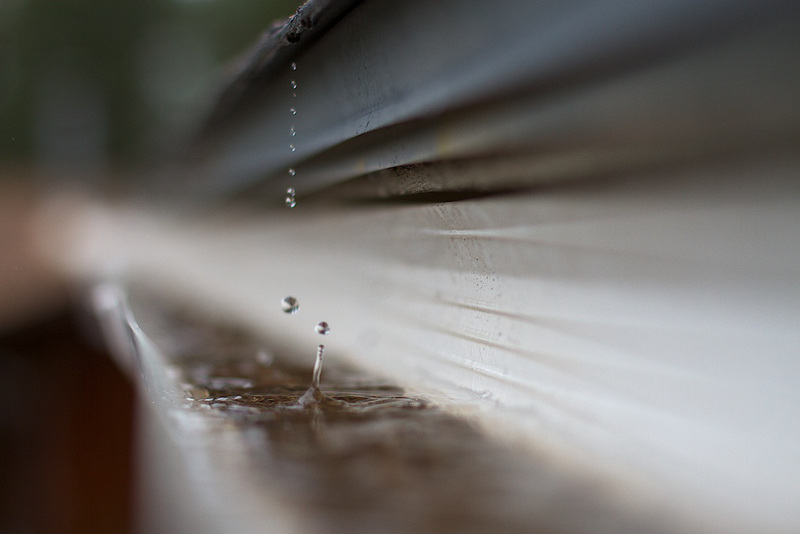 Walking out on my deck, I noticed the drops of water streaming off the edge of the roof into the gutter. It was the pattern than caught my eye; and with the rain having just topped, some good light was coming through the clouds to the east. When I stood on the chair, I was below eye level of the gutter, and so could not see into it, just slightly above where little rivulets were flowing down. I had a hunch, that maybe, if I aimed the camera looking down the rain gutter, I could get something interesting with converging lines. I wanted to go with a more open aperture as I did not want to see in detail my neighbors house at the end, but also knowing that a shallow depth of feed would work IF I could get the focus on the streams. I took maybe 8 of these, but the frozen motion drops here; one falling and one rising off of a crown of a splash, were magical. I just wish I had gotten a tighter focus. If I was more diligent, I might have gotten out my 6 foot ladder and a better vantage point and I might have gotten a more technically proficient photo. But the magic of a blindly aimed photo, where later I see what I could not see, makes up for that in a big way.